What’s the 4-1-1 on women in academia? The good news: More professors than ever are pursuing tenure-track positions. That said, the growth of women faculty currently on this track or already tenured in business schools has been frustratingly slow, with the Association to Advance Collegiate Schools of Business finding just “32.3 percent of all Associate Professors and 20.2 percent of all Professors being reported as female in 2015–16.” (Association to Advance Collegiate Schools of Business). Accompanying the statistics is an uncomfortable feeling rippling just under the surface that, while it’s an uphill battle for anyone pursuing a tenure track, that climb is steeper for women. And it is. So, what exactly is going on? There is research that is starting to verify that women are not cited as often as men, and that when women co-author, they tend to be credited less often. Soderstrom and Farkas had both experienced this phenomenon in isolation but knew they were on to something bigger. They wondered: How can we open this conversation to a larger group and, given the state of affairs, what can we do proactively?” For starters, they reached out to Jane Dutton at Ross about an idea for a panel. Jane gave sage advice, noting that “there is a risk that an event such as this could leave people not only angry, but hopeless.” Jane challenged the team to find a way to weave in the stories that would leave people energized, inspired and connected—and would highlight various positive and possible outcomes. In a moment of serendipity, Soderstrom and Farkas ran into Emily Block, a faculty member at the University of Alberta. Block shared her story of overcoming challenges on her path to tenure and noted how happy she was in a new role. As Soderstrom and Farkas reflected on what type of program may be helpful to women academics, they kept coming back to Block’s story. They decided they wanted to hear the stories of women at various levels: those who had obtained tenure at their original institutions and those who had not and transitioned into equally compelling new roles. They wanted to find women who were willing to share their real stories and showcase their persistence. Invitations were sent to a number of vocal and recognizable academics who were either leading centers, pursuing research in this area or simply recognized for their experience navigating this path. They were totally unprepared for every one of them to accept emphatically. STEM (science, technology, engineering and math) has become a common catch-all for issues related to women’s advancement academia. Farkas opined that it isn’t that simple. “Evidence of bias exists across disciplines. This is a gender and academia issue that requires some internal reflection on the part of business schools.” Soderstrom and Farkas executed a pilot survey to a subset of AOM members that explored topics related to their perceived ability to reach their career goals, including mentorship, networking, confidence and ability. The data showed that, relative to men, women were more likely to experience their workplace as sexist, disrespectful and unjust. Women were also more likely to frequently feel negatively about their ability to meet career goals in academia and were more likely to consider leaving the profession. It’s not just a STEM issue—these issues cut across all dimensions of management academic careers: research, teaching and service. Soderstrom and Farkas have since modified the survey, and the new one will be distributed to a global sample of faculty from the top 100 international business programs to gain global insights. The team was thrilled with both the response to their survey and their blockbuster panel line-up. In the end, about 120 people said they would attend the symposium. As women (and men!) stood against walls and sat on floors in a room that was supposed to fit 90, the final count exceeded 200. The concept of each academic becoming a “mirror,” with the responsibility to reflect others’ strengths. 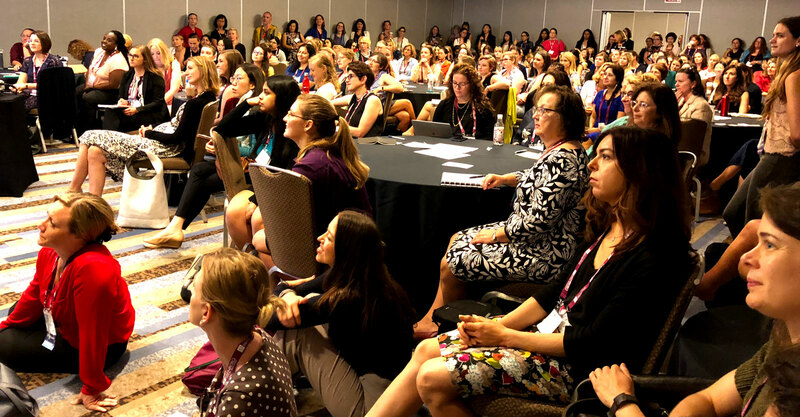 Building this supportive network of women who are advocating for each other enhances connectivity, raises the stature of women academics and ultimately serves as inspiration for other women, effectively completing the feedback loop. It became apparent that these needs have multiple layers. For example, Soderstrom notes, “the surface was barely scratched on how race or ethnicity plays into these important conversations. Academics of color have unique, but related, struggles, which are then exacerbated from a gender perspective.”The pilot study did find that women perceive far more bias and unjust behaviors toward colleagues of color than men do. Some challenges are universal, but there are surprisingly unique needs at different levels as well: graduate students who are just starting to teach, junior faculty who are trying to get published, and tenured faculty who want to explore how this privilege can be deployed to support engagement and advocate for change. Even basic levels of assistance can make a huge difference and be a very visual, public display of support. For example, improved accessibility for women at AOM by providing child care. Soderstrom and Farkas are striving to publish this research in an academic publication and are fine-tuning the AOM proposal for next year. Coincidentally, the theme for next year is Understanding the Inclusive Organization. Women need support and help navigating. In the coming year, the team is doubling down on a proposed workshop at AOM with multiple tracks to help meet the demand for support across various divisions supported by their research. Last, the team recognized an under-realized opportunity for discussion. While attendees were hanging on every word of the panelists, they too have stories, questions and opportunities that need to be both heard and answered. Women in academia need space to connect and learn from each other.